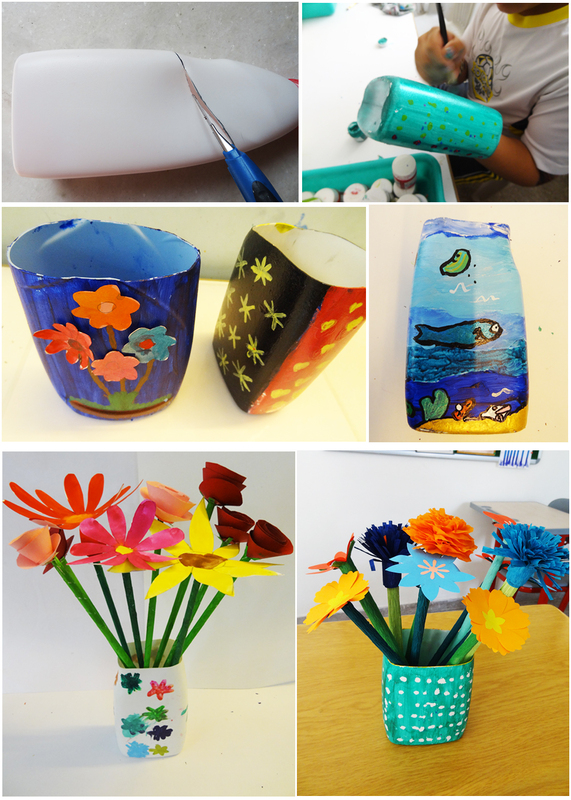 Easy activity reusing plastic bottles. They can also make great mother's day gifts! Step one is to wash and dry the plastic bottles. Draw a line all the way around the bottle using a felt pen before cutting. A sharp cutter is required for cutting thick plastic bottles like fabric softener and shampoo bottles. To speed up the process, the blade can be slightly heated before cutting. If filing the cut edges is difficult, simply use a colourful duct tape to stick over and around the rough edges. So now the bottles are ready to be given to children for painting and decorating! Acrylic paints, including the metallic versions were used to paint patterns and other designs. Paper cutouts (using pattern punches) and 3D glitter outliners also work very well to embellish. As always, I love to provide a variety of stuff to decorate and watch the magic happen :) There is so much satisfaction in creating what we like! We'll also post flower making ideas. We had so much fun making those beautiful flowers and hope to share that soon.